A user profile consists of the cumulative characteristics of your target audience. In the profile, you can combine different conditions, such as user interests, income level, family status, and visits to specified locations. By serving ads based on characteristics, you can avoid spending your ad budget on non-targeted impressions. Crypta technology lets you precisely target your audience. It analyzes user behavior on the internet and determines what particular group they belong to. To do this, Crypta technology tracks the behavior of typical representatives of that group. For example, it looks at what words they use in their queries, what sites they visit, and what time of the day they use the internet. You can segment the audience in detail by selecting users based on your key parameters. 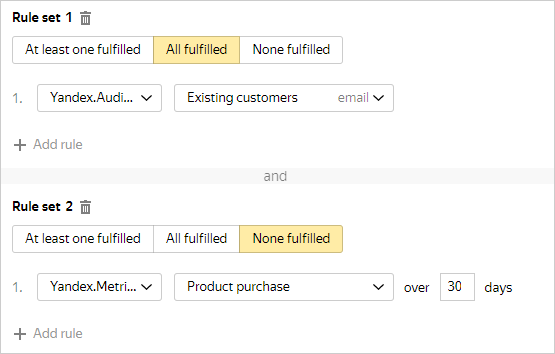 For example, you can target ads at people who put something in their shopping cart on your site, customers from your CRM, visitors of the locations you have set, or people who've already seen your display ad. 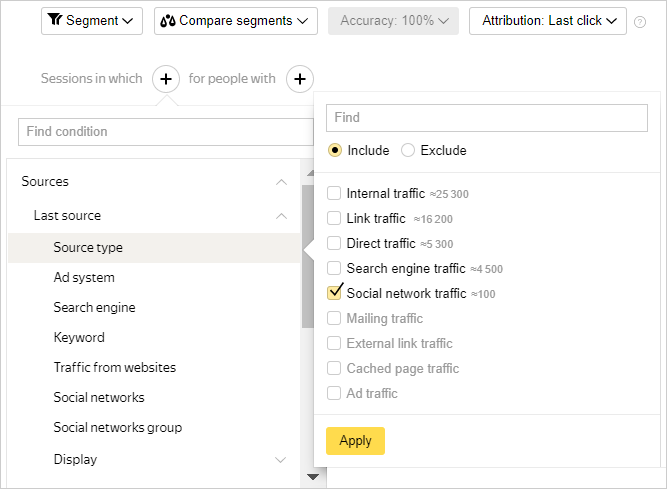 To describe your target group of users, configure goals and segments in Yandex.Metrica and Yandex.Audience. 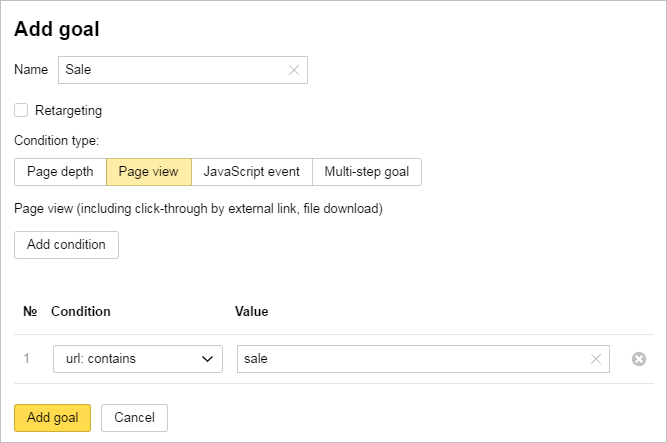 Enter goals or segments in Yandex.Metrica. Goals relate to the behavior of a specific user on your site. For example, a goal might be for a user to add a discounted product to their shopping cart or start a new order. Segments describe characteristics of a user during a specific session. For example, they describe how the user got to the site (from a social network, from Yandex search), what device they used to view the site (a mobile phone, desktop), and their gender and age. users similar to your customers based on their Internet behavior. The forecast coverage will help you estimate the number of weekly visitors who match the user profile characteristics you set. You will see two values in the estimate. On the right, you'll see the total number of users. It will depend on the display regions and banner sizes you selected, as well as your list of prohibited sites. The number of users that match the profile description is on the left. Any changes you make to the profile will affect your estimate data (which allows you to evaluate your potential audience reach). A Yandex.Audience segment based on geolocation data with the Audience: current location criteria (for more information about segments, read the Yandex.Audience Help). A Yandex.Audience segment that was created less than 6 hours ago or more than two weeks ago and was not used in Yandex.Direct. If you have selected automatic display strategy, go to the strategy settings once you have saved the ad group. The system will take into account the size of creatives and user profile settings, and offer an updated recommendation for the average price in order to enable efficient budget spending over the period. Look at the color scale while setting the price: a bid in the greens will increase your reach, while a bid in the yellows or reds will maintain your reach at the competitors level or lower. You can see how the recommended price changes depending on the intended coverage: wide or narrow. Yandex.Audience segment based on geolocation data with the Audience: current location criteria (for more information about segments, read the Yandex.Audience Help). Yandex.Audience segment that was created less than 6 hours ago or more than two weeks ago and was not used in Yandex.Direct.